Location: On Hoʻowili Road off of Poʻipū Beach Road, Poʻipū. 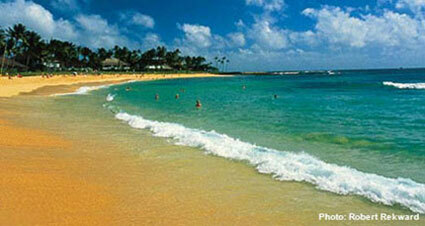 Description: Poʻipū Beach is a white sand beach approximately 1,100 feet long and fifty feet wide. The eastern half of the beach is backed by Poʻipū Beach Park and the western half by several hotels. A small boulder breakwater forms a protected swimming area in front of the beach park. Nukumoi Point, in the center of the beach, is a tombolo, a sandbar that joins a shallow rock islet to the beach. The sandbar is emergent at low tide, and the ocean bottom slopes gently to overhead depths on either side of it. On the east side of the point, surf breaks on a shallow sandbar. On the west side, surf breaks on a submerged reef. Facilities in the beach park include restrooms, showers, and parking. Precautions: Poʻipū Beach is subject to seasonal high surf, especially during the summer months. During periods of high surf, rip currents run through both of the surfing sites. Lifeguards are stationed at the beach park. Check with them before going in the water. Highlights: Poʻipū Beach, the most popular beach park on Kauaʻi's south shore, is heavily used by visitors and residents. This beach has something for everyone: a protected swimming area for families with little children, a bodyboarding site directly in front of the park for older children and novice adults, a surfing site for experienced surfers, and a good reef for snorkeling. Hawaiian monk seals regularly come to rest and bask in the sun at Nukumoi Point. Po’ipū means "completely overcast" or "crashing," as waves.